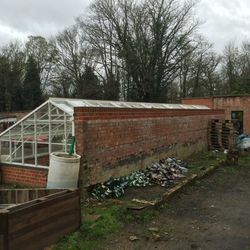 Bedfords Park Walled Garden is a community-focused food growing space on the edge of London. It sits within a nature reserve and an historical setting. The aim of the garden is to teach people about food, growing their own, giving valuable life skills to some and ‘skills for working’ to others. There are gardening clubs for the new and the experienced as well as many events, workshops and activities to enjoy whether you’re a gardener or not. We don’t have enough storage so we’re building 2 sheds. One small one at the back of the Fern house and the other long one at the back of the pineapple house. Both these aspects are north facing and therefore no good for planting and ideal for the sheds we need. The sheds will be made from as much reclaimed and reusable material as possible. The community project is currently Looking for various surplus building materials and roof tiles! Also any volunteering from tradesmen would be much appreciated to complete the project.